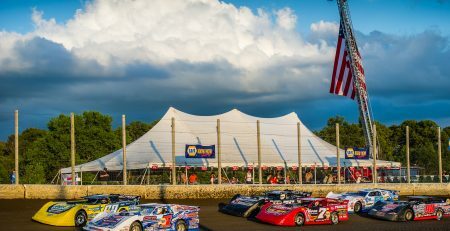 Tickets on Sale for World of Outlaws Return to Deer Creek Speedway in Minnesota on June 29SPRING VALLEY, Minn. — December 5, 2016 — The World of Outlaws Craftsman Sprint Car Series returns to Deer Creek Speedway in Spring Valley, Minnesota in 2017 on Thursday, June 29 for the Clash at the Creek. Tickets are now on sale and can be purchased online at slspromotions.ticketforce.com or by calling SLS Promotions at 815-344-2023. The World of Outlaws Craftsman Sprint Car Series last competed at Deer Creek Speedway in 2015, with Brad Sweet picking up the win over eight-time and defending series champion Donny Schatz. Daryn Pittman, who is Sweet’s teammate at Kasey Kahne Racing, led the first two laps of the 35-lapper, before Sweet took command, holding off a late-race charge by Schatz. Joey Saldana won the World of Outlaws Craftsman Sprint Car Series debut at the three-eights-mile in 2009 and repeated the following year. Steve Kinser, the 20-time Outlaws champ was victorious at the track in 2011, while home state driver Craig Dollansky won at Deer Creek in 2012. Ian Madsen scored his first-career World of Outlaws Craftsman Sprint Car Series win at Deer Creek in 2013, while Paul McMahan was victorious at the track in 2014. A total of 17 drivers won A-Feature events with the World of Outlaws Craftsman Sprint Car Series in 2016, including full-time series drivers: Pittman, who finished second in points, David Gravel, who was third in the standings, Sweet, who was fourth in points, Saldana, who was fifth in the final tally, Shane Stewart, who was just behind Saldana, along with Jason Johnson, who was seventh in points, Logan Schuchart, who was eighth in the standings, Jason Sides, who was ninth and reigning Kevin Gobrecht Rookie of the Year Award winner Greg Wilson. 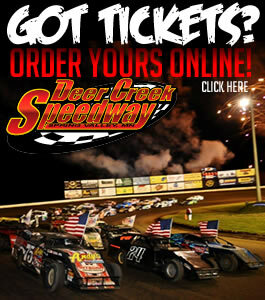 Tickets for the Clash at the Creek, featuring the World of Outlaws Sprint Car Series at Deer Creek Speedway on Thursday, June 29, 2017 can be purchased online at slspromotions.ticketforce.com or by phone at 815-344-2023. 500 FREE Pork Sandwiches This Weekend at Deer Creek Speedway!